All his life, Renegade has been told that he’s too young to fly his own plane…but he wasn’t named “Renegade” for nothin’! Yeah, so flying a plane at six years old is a little risky, and a lot illegal…but since when did heroes care about pesky little things like laws and training and safety measures? Renegade was born to fly, and it was going to take more than that to stop him! So yeah, so he snuck out onto the airfield and tried to steal a plane…so what? Those air marshals should be thanking him for alerting them to the holes in their shoddy security! And yeah, so he’s grounded for the rest of his life - or until he becomes 18, whichever comes first, according to his dad - but if they think all of that is going to make him give up…! Well, then they’ve actually done a pretty good job, because on second thought, being arrested by the cops and then being yelled at by his parents was not Renegade’s version of a good time, so, yeah…maybe he will stick around the house after all and just fly later when he’s old enough to start working toward his pilot’s license. In the meantime, though, don’t let Renegade’s dreams of flying die...after all, you can't blame a kid for having an early sense of direction, yeah? So get him this Ride in an Airplane Costume! The silver stuffed plane features white & blue stripe details along the flap & wings, and it's held in place with two adjustable blue straps...that way Renegade can feel like he's manning a plane, even if he's just hanging out, safe and sound, in your living room! 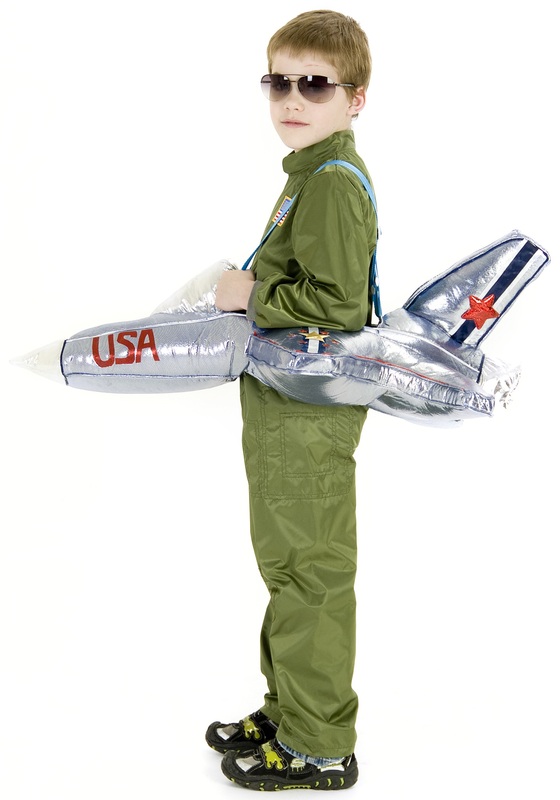 Pair it with an Air Force costume, and watch Renegade's imagination take off!